100% New and High quality, can record and play. 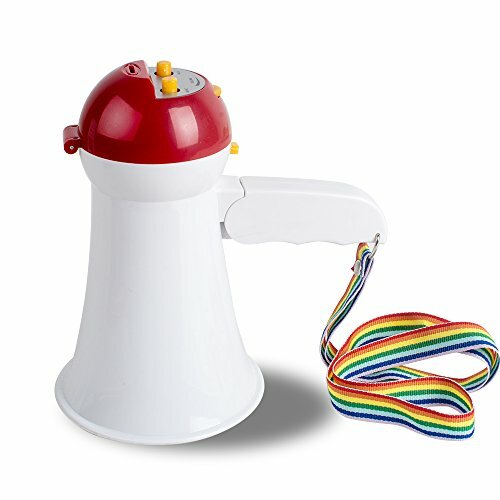 With this professional megaphone, amplify your voice with clarity. Sound loud and clear, the propagation distance. Ergonomic Pistol Grip Chassis and light-weight. Utilized by indoor & outdoor sports activities, police, firefighters, cheerleading, schools or director. Integrated Microphone for talking and voice projection adjustable volume control, folding handle for portability,convenient carry strap. Small size, light weight, easy to carry, beautiful appearance, well-proportioned design, folding handle design, waist or shoulder hanging hanging use.